The can moving does influence the current through the coils. Here’s a graph with the can moving, red and another without it moving, blue superimposed on the same plot. The current graphed is the current through the driving can crusher coil, as opposed to the current through the can. The x-axis denotes microseconds, and the y axis is in kA of current. The can movement code also looks good! Here’s a graph of the can wall moving. The horizontal line at the top is the can wall immediately before it begins to crush. 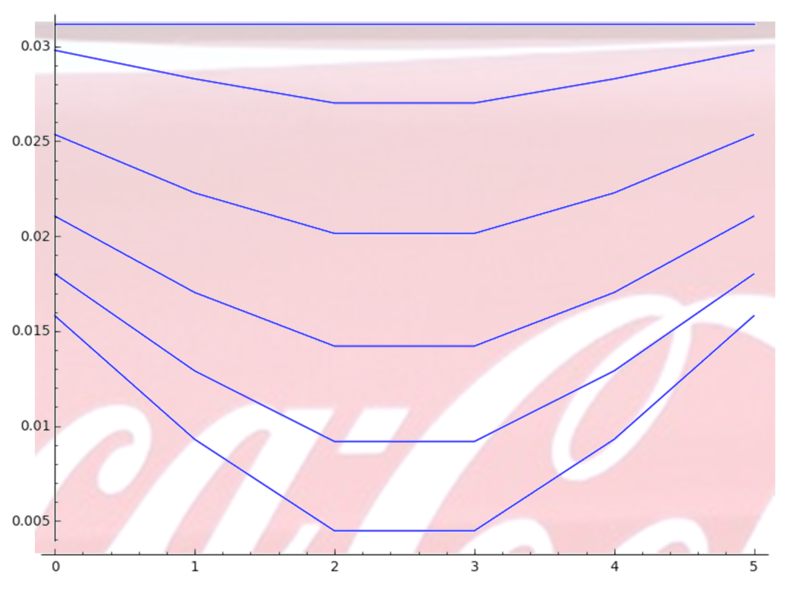 Each successive line as your eye moves down the y axis denotes the six segments of the can that are modeled, see picture at beginning of this entry. The x axis is the segment index and the y axis is the radius of the segment. Next: Clean the code and make an initialization function. Write up a simulation that captures the two curves shown above that uses the initialization function. It is still unclear that the diffusion pump path is being vacuumed well. The next step will be to attach the thermocouple gauge in place of the leak detector’s gauge on the nitrogen trap wall.